Rick passed away at the age of 56 years, following a battle with cancer. He was surrounded by the love of his family at his home in Westport, February 1st, 2019. 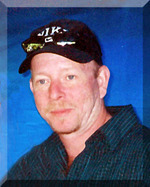 He was the cherished husband of Connie (Bigras) Morris, father of Amanda (Jamie Richmond) and the late Greg. He will be sadly missed by his siblings Marlene Sergeant (John MacIntosh), Mona (Tony) Sweeney, Evelyn Morris and Linda Morris (Trueman Yuill), sister-in-law Michelle Bigras, stepfather Ronnie Fagan and numerous nieces, nephews, their families and many friends. Rick was predeceased by his parents John and Norma (Byrne) Morris. Rick was a mechanic for many years at Perth Soap and Shandex. Friends and family will gather for a memorial to be held in the Chapel of the Blair & Son Funeral Home, 15 Gore St. W. Perth on Tuesday, February 5th, 2019 at 1:00 P.M. A reception will follow in the Blair & Son Family Centre. In remembrance, contributions may be made to Great War Memorial Hospital Foundation or Lanark Animal Welfare Society (L.A.W.S).